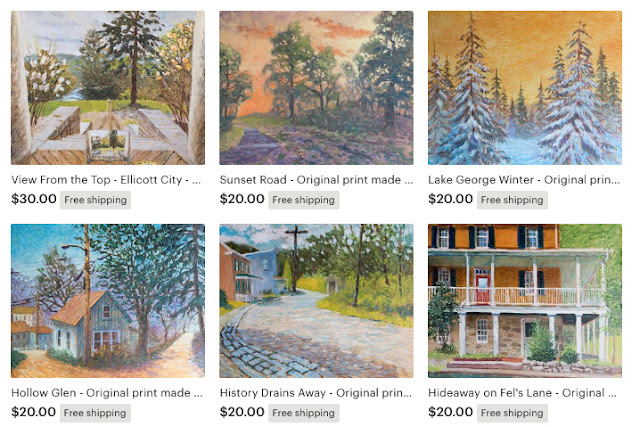 Six new prints are in the Etsy shop. Five of the paintings were painted outdoors at the locations. First, "A View From the Top" painted from the Patapsco Female Institute. "Sunset Road" was painted on Slack's Road, near Historic Sykesville. "Lake George Winter" was painted from my memory of a trip there in 1978. "Hollow Glen" was painted on site in Historic Oella. "History Drains Away" was painted on site on Fel's Lane, Historic Ellicott City. "Hideaway on Fel's Lane" was also painted on site on Fel's Lane, Historic Ellicott City.